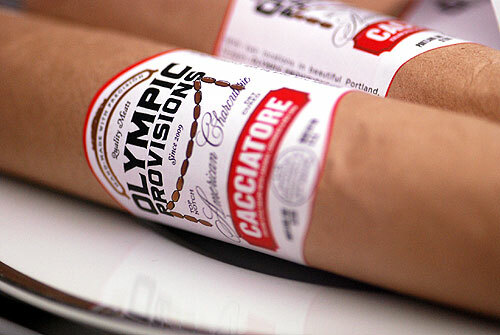 Olympic Provisions is home to Oregon’s first USDA-approved salumeria, established in 2009. Starting with fresh Northwest pork, the Olympic Provisions team hand-butchers the pork to 100% lean, then reintroduce hand-cut fatback. This nearly extinct Old World technique results in charcuterie that’s as smooth and creamy as it is true in pure pork flavor. Garlic is freshly chopped and spices are ground daily in-house so that the flavors within the salumi are as vivid and pure as possible. Olympic Provisions crafts excellent salumi in a variety of flavors. At Rafns' we typically carry Finocchiona, Sopressata, Cacciatore, and Chorizo Rioja. These salumi are delicious on their own, but are equally as good on a cracker or as part of an antipasto plate.